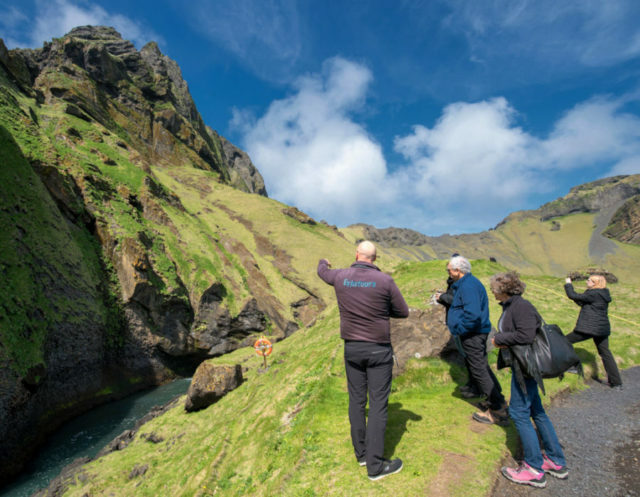 My favorite underappreciated corner of Iceland is the Westman Islands — the no-longer-secret discovery of our Rick Steves Iceland guidebook co-author, Ian Watson. This installment of my Iceland blog series explains why, if you want to escape some of the tourists — and can flex with unpredictable weather — the Westman Islands are worth fitting into your Iceland itinerary. In Iceland, it seems every traveler is in the same two- to three-day rut. (It’s a glorious rut…but it’s a rut.) That’s why I was thrilled that our co-author, Ian Watson, insisted on including the Westman Islands in our new Rick Steves Iceland book. 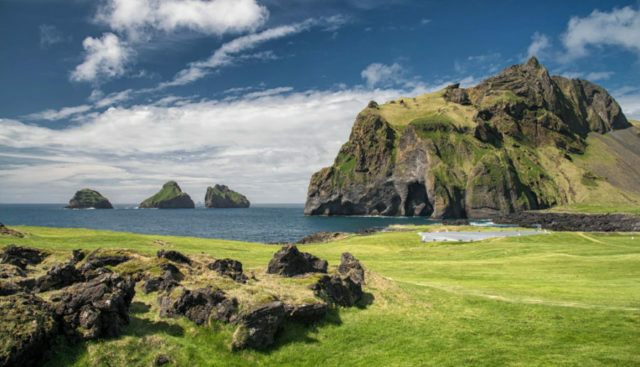 Because the Westman Islands — which sit just eight miles off the South Coast — are Iceland’s undiscovered gem. Weather caveats inside, once you arrive on the Westman Islands, you’ll be glad you came. There are eight islands, but only one — called Heimaey — is inhabited. The town itself, while quite functional, has a pleasantly workaday charm. 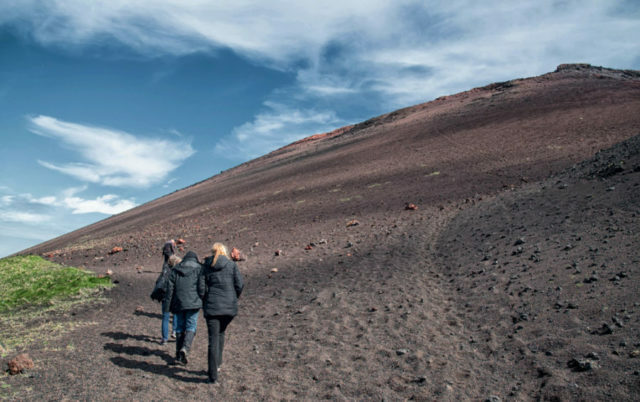 But you’re not here for the town — you’re here for the glorious setting, the recent volcanic history, and the evocative sights. If you’ve heard of the Westman Islands, it’s probably because of the 1973 eruption of the Eldfell volcano. In the middle of one dark, frigid January night, the islanders awoke to the thunderous sound of a volcano erupting overhead, shooting geysers of lava 500 feet into the air. Heimaey was evacuated, and for the next several months, the world watched as a slow-creeping wall of lava gobbled up part of the town, enlarged the island’s size by one-fifth, and threatened to seal off the harbor. Eventually Eldfell — meaning “Hill of Fire” — fell dormant, and the islanders moved back to dig out of the ash and tephra. Today, as you walk on the craggy bluff over town, it suddenly dawns on you that you’re standing 50 feet above what was, not that long ago, a busy residential street. 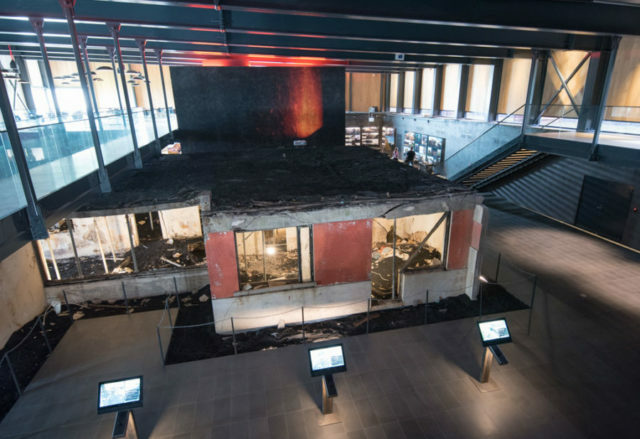 The best volcano-themed museum in Iceland is called Eldheimar, which is built around an actual family home that became stuck in lava in 1973. You can peer into the house and see the family’s possessions right where they left them as they fled. All around, high-tech exhibits track the progress of the eruption. You can even climb all the way up to the summit of Eldfell, which is still warm to the touch. It’s about a 30-minute hike up from the museum. On the way up, you enjoy higher and higher views over the dramatic islandscape, and pass technicolor chunks of volcanic rock. You can see most of Heimaey’s main sights on foot. And if you bring your rental car onto the ferry, exploring the rest of the tiny island is a snap — you can drive from one end to the other in about 15 minutes. But for a more complete and informative look at the island, I enjoyed a two-hour minibus tour with Ebbi from Eyja Tours. Ebbi offers a local perspective, while making sure you get to see the big natural-rock amphitheater that hosts a popular summer music festival, good views of the smaller islands offshore, and rolling hills dotted with lambs. 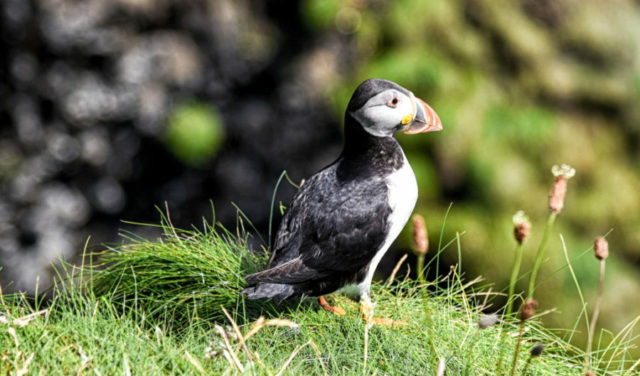 Best of all, in summer (usually early June-late Aug), you’ll likely see puffins. While puffins are the unofficial mascot of all of Iceland, the Westman Islands have the biggest puffin population in the world. A baby puffin is called — wait for it — a puffling. And at the end of each breeding season, the freshly hatched pufflings take off for the first time. Some of them get confused by town lights and wind up crash-landing in the streets. Local kids take them in and nurse them back to health. 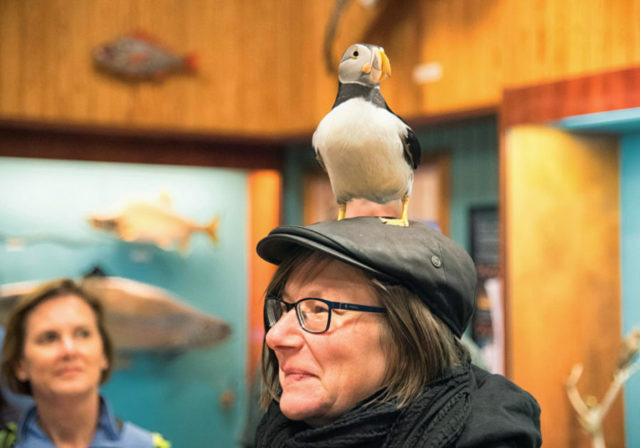 But occasionally, a puffling can’t quite be rehabilitated — so they’re taken in by the Westman Islands aquarium, called Sæheimar. 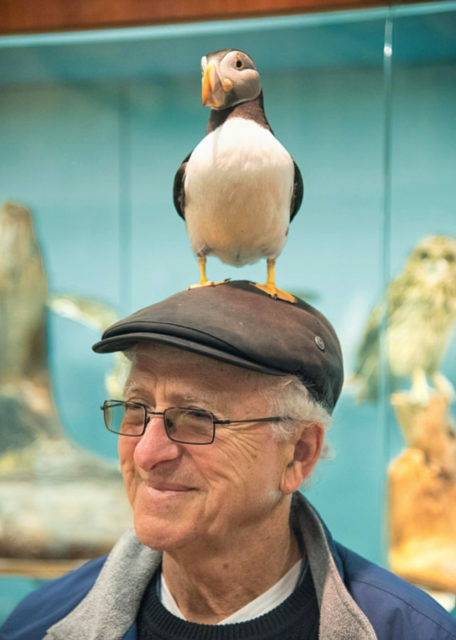 One of these puffins, named Tóti, is the museum’s mascot and star attraction. 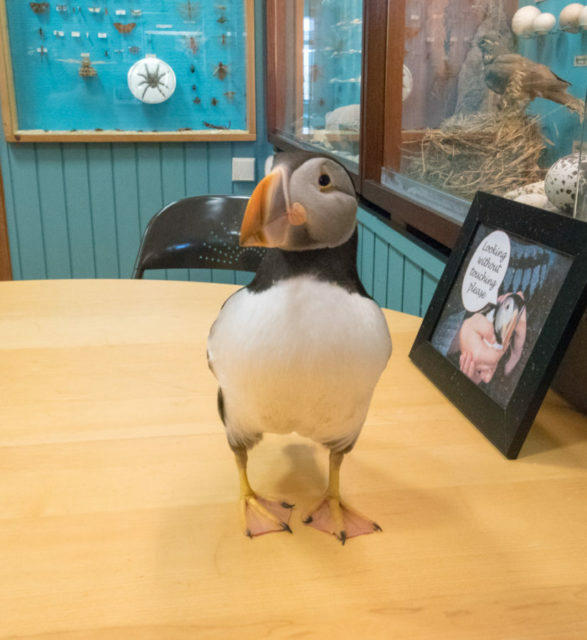 Visitors can’t pet Tóti (because of the delicate oils in his plumage), but it’s a goofy thrill to watch him waddle around the exhibits, followed by earnest staffers who scoop up his runny droppings. Intrigued? 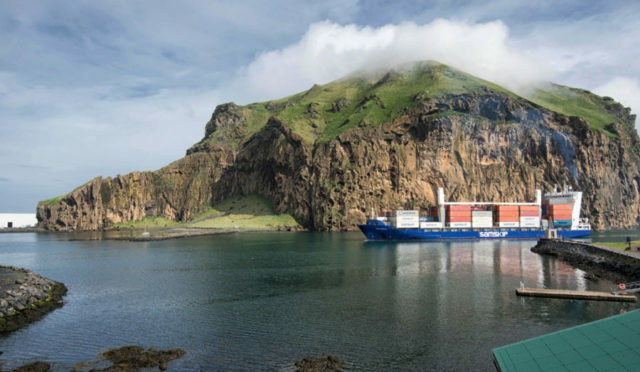 Here are the logistics for reaching the Westman Islands: You can fly on Eagle Air from Reykjavík’s handy domestic airport (near downtown), making it easy to do a one-day round-trip. Or you can take the ferry from Landeyjahöfn on the South Coast, which takes about 40 minutes each way, and carries both walk-ons and cars. But here’s the catch: in bad weather, either the plane or the boat — or both — can be cancelled. 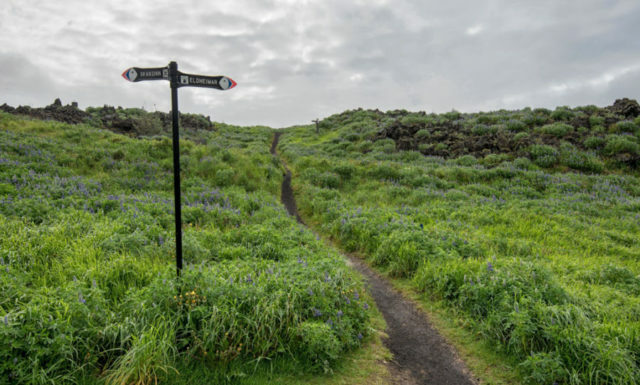 If planning a trip to the Westman Islands, have a Plan B in mind. If you’re based in Reykjavík and the flight is grounded, simply choose another side-trip. But the best plan may be to schedule two overnights (and the better part of two days) for the South Coast. As the date approaches, keep an eye on the weather forecast, and devote the better-weather of your two days to the Westman Islands, saving the drearier day for the South Coast (which is plenty spectacular in any weather). 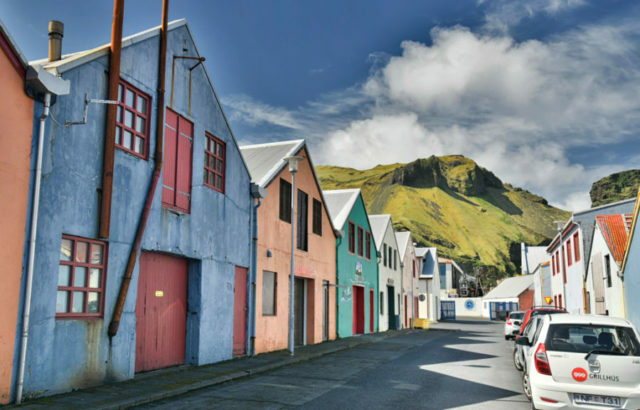 While planning a visit to the Westman Islands comes with an element of unpredictability, flexible travelers who make the trip are rewarded by one of Iceland’s most delightful, undiscovered corners. Just tell Tóti I said hi. Heimaey will provide a delightful day trip irregardless of how one gets to the town. The impact of volcanic activity here remains a poignant reminder still today of severe damage caused by the Eldfell eruption of 1973. Of course the over-sized puffin character in the port area is an absolute must for a photo opportunity. Sailing both in to and out of the port itself holds beautiful views regardless of which way one is headed. We enjoyed the company of an experienced tour guide while we were here making time spent there very worthwhile. Excellent post, thank you very much for sharing! Iceland is definitely on my wish list. I’ve heard it is extremely expensive… was a little disappointed to see no mention of it (like how much is that little plane ride?) Thanks again!! We did a Hurtigruten adventure cruise around the entire island and thoroughly enjoyed having done so. We are glad we went when we did as tourist numbers keep rising. It is expensive, but I feel Rick Steve’s guidebook has some excellent ideas to wisely spend financial resources while there. Anxious to read further blogs about Iceland. Yep, it’s expensive. But you can cut costs with some smart budget tips. 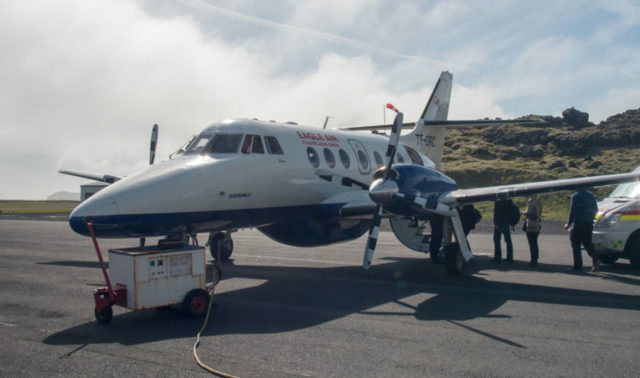 The round-trip flight from Reykjavik to the Westman Islands is around $250-300 for the day. That’s pricey, sure. But that’s about what you’d pay for an all-day side-trip on a package bus tour.